The CS320 features a blackbody thermopile detector that has a better spectral response than similarly priced silicon-cell pyranometers. The detector uniformly absorbs solar radiation across the entire short-wave solar spectrum, which allows the CS320 to be used under plant canopies or lamps; when the sky is cloudy; or for reflected radiation measurements. The CS320 includes an internal heater that minimizes errors caused by dew, frost, rain, and snow blocking the sensing path. The heater is low powered, and can be controlled by the datalogger. You can store calibration coefficients within the sensor. Its digital SDI-12 output eliminates potential measurement errors associated with analog pyranometers. Additionally, the cable detaches from the sensor head, simplifying field servicing. 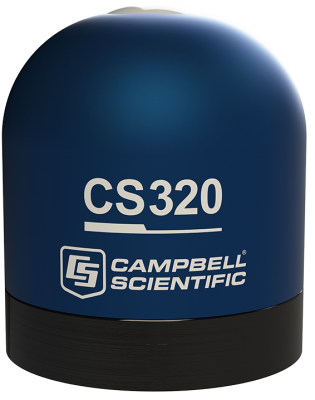 The CS320 will be available soon for environmental researchers, large monitoring networks, and many other meteorological applications. Its blackbody spectral response, heater, and digital output give you greater confidence in your data, at an affordable price.